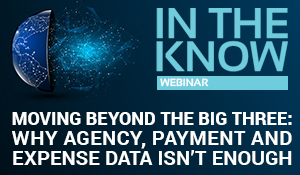 Moving Beyond the Big Three: Why Agency, Payment and Expense Data Isn’t EnoughTuesday, April 30 at 1:00 PM EDT / 10 AM PDTSponsored by: AdvitoRegister Now! We all know that spend transparency and supplier negotiation strategies are important. With advancements in data and technology, you might be thinking that now is the time to integrate your agency, payment and expense data. But there are many important factors that the “big three” can’t capture. Integrating third-party data sources can give you a holistic view while also being a cost-effective business intelligence solution for your program. Join us for this hour-long webinar to learn why the integration of traditional data sources just isn't enough anymore and what you can do about it, simply and effectively, to elevate the returns of your travel program. Register now for this “In the Know” webinar with content developed and sponsored by Advito. 6 Ways to Save Money on Business TravelThursday, April 25 at 1pm EDT / 10am PDTSponsored by: TripActionsRegister Now! While corporations have intensified the focus on traveler satisfaction in managed travel programs, savings remains a top priority. What are the best ways to drive savings in managed travel and what are some of the innovative new practices to stretch travel dollars? 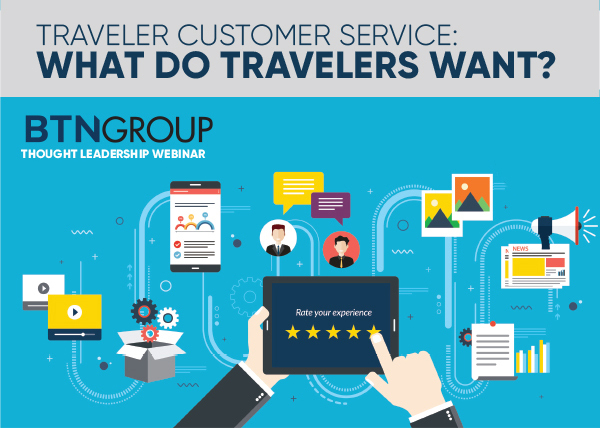 Listen as travel managers and an industry consultant share their tips during this 60-minute BTN Group thought-leadership webinar, sponsored by TripActions. - With limited time, where should travel buyers focus savings strategies? - What are new and innovative ways companies can save? - How do you balance cost savings and traveler satisfaction? - How do you best measure savings and program ROI? Travel Policy as an Employee Recruitment/Retention ToolThursday, May 2 at 1:00 PM EDT / 10:00 AM PDTSponsored by: Direct TravelRegister Now! With the tightest labor market in decades, job candidates and current employees are more closely scrutinizing travel policies, preferred suppliers and programs. What are companies doing to ensure that their travel policies and programs are not only competitive, but leading edge? 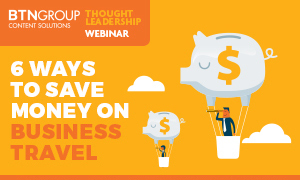 Register now for this BTN Group thought-leadership webinar, sponsored by Direct Travel, to hear leading practitioners detail their concerns, what they’re doing and why. How are they looking at class of service, upgrade, premium economy, supplier status programs and even flight delays to better view their programs through the eyes of prospective or current employees? What impact are changes having on travelers and their bottom lines? And, how should you review your own program? With so many ways to book business travel, what are industry best practices for managed travel programs? How should companies configure, communicate and set policies that best balance compliance and savings with traveler satisfaction and experience? Register now to hear leading practitioners share their experiences and practices in this 60-minute BTN Group thought-leadership webinar sponsored by Air Canada. Changing traveler behavior is never easy. So why bother? There's good reason. Get your travelers engaged to increase traveler satisfaction and hotel savings. 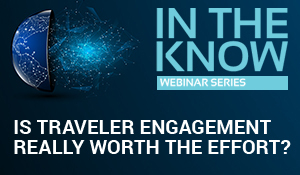 In this “In The Know” webinar, sponsored and developed by BCD Travel, you’ll hear what actions program managers can take to drive traveler engagement. Hear first-hand how the travel team at Ingersoll Rand grew engagement, which ultimately resulted in a 28 percent increase in hotel-to-trip-night bookings. Ask your own questions of our expert panel during the live Q&A. The amount of data available to travel category managers today is unparalleled. Although this offers a golden opportunity to drive savings and improvements in travel programs, knowing what metrics to focus on first can be somewhat overwhelming. 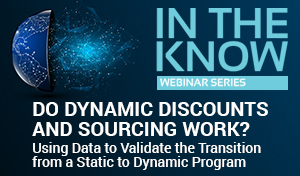 Register now for this 45-minute “In the Know” webinar developed and sponsored by TRIPBAM to learn how to make sense of the data available and gain actionable insights to determine when to use flat rates versus dynamic rates to empower you to drive hotel savings beyond sourcing season. Ask your own questions during the live Q&A. As personalization becomes the key to customer engagement and satisfaction—including your managed business travelers—how can the corporate travel industry ensure privacy and, in the face of a breach, facilitate recovery. Corporate data management and legal experts discuss the trends, potential solutions and answer your questions. When was the last time you broke through an innovation barrier for you travel program—been a while? Hone your strategies with leading travel managers who consistently bring innovations large and small to the table. Plus, a start-up consultant talks about why the industry is ripe for disruption and why the best travel managers will be a part of that. Is your travel management company meeting the needs of your travelers, management, and key stakeholders? If not, what’s the best roadmap to follow to fill in the gaps? 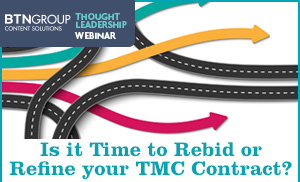 Is it time to rebid your TMC contract or explore options in the ever-changing marketplace? Or should you focus on refining existing contracts and services to better align with your business travel needs and current stakeholder expectations? 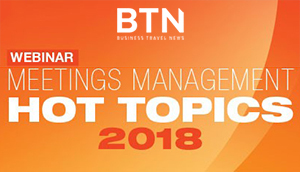 Listen as travel management professionals share their experiences and tips in this one-hour BTN Group thought leadership webinar, sponsored by Egencia. This webinar is an interactive experience—you can ask questions during the Q&A segment. Blockchain experts get real with how the technology is poised to change the managed travel space. Will it change everything? No way. Are there business travel pain points that blockchain could address? Innovation it will engender? Yes, absolutely. BTN's expert panel will get you up to speed on what blockchain is—and what it is not—and how it may be applied to corporate travel in the near future. Air travel distribution is changing. If you are coming into the distribution discussion only as IATA's New Distribution Capability is connecting new pipes, you don't know as much as you need to know to manage your travel programs. NDC opens up new opportunities for travel managers to control their programs, but it also opens up complexities that are not fully solved by existing technologies. If travel managers can't work with their partners from a position of knowledge, the solutions can't be tailored to your real needs. In this 60-minute webinar, Business Travel News brings together an expert panel to explore distribution transformation, why NDC is important and if there are other promising technologies on the horizon for travel distribution. Moreover, we'll explore what it could mean for corporate travel program innovation and where the industry will need to overcome challenges. It may surprise industry outsiders to learn that frontline travel agents remain a vital force in corporate travel. They weren't wiped out by the Internet. They weren't erased by self-booking tools. And, no, artificial intelligence and bots aren't taking over anytime soon. Who is the frontline counselor? How is their role evolving? What challenges do they face in their jobs? What technologies do they use? How are TMCs attracting the next generation of agents? Business dining is one of the largest travel spend categories – at $77 billion annually; yet, not much has been done to understand business diners and how they spend corporate dollars. Dinova conducted a joint research study to help you understand the dining habits and preferences of business travelers to provide a more positive travel experience today and shape effective policies for the future. Hear the survey highlights with comments from a corporate buyer in this 45-minute BTN Group "In the Know" webinar, with content sponsored and developed by Dinova. Small meetings are the invisible giant: two-thirds of all corporate event spend and growing. But, as we all know, small meetings are rarely simple and often can include many complexities around adherence to policy, compliant contracting, and attendee management. There are new technologies and approaches, but what is the best way to get adoption, visibility, and savings? Hear from the meetings and events leadership at Anthem in this free BTN Group “In the Know” webinar developed by Bizly. Learn how to create an effective policy for small meetings, ensure companywide adoption, and deliver ROI. 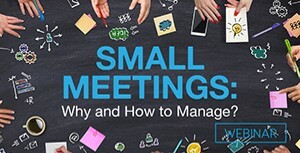 Gain a better understanding of the opportunities and challenges around small meetings, and learn how to customize a great program at your company. As more companies expand the footprint of managed travel programs to new countries and regions—or refine existing initiatives--what policies, technology, communication strategies and practices should they consider? 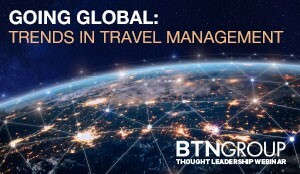 Listen as travel management professionals share the latest trends and watch words on policies, local practices, technology and new developments during this 60-minute BTN Group thought-leadership webinar, sponsored by Travelport. Ask your own questions during the live Q&A. Travel management in recent years has increasingly reported to procurement or finance to best control costs. However, as more companies consider business travel as a tactic to grow their businesses and navigate talent wars, travel management is more frequently working in tandem with human resources, sales and other teams to re-evaluate policies, practices, costs and perks of the job. 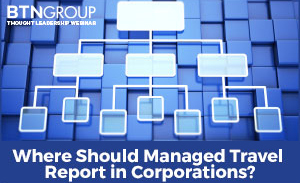 Join us for a discussion of the pros and cons of various reporting structures in this 60-minute BTN Group thought-leadership webinar, sponsored by Air Canada. Hear case studies from travel managers, perspectives from industry experts and ask your own questions during the live Q&A session. Through application programming interfaces (APIs) and distributed ledger technologies, suppliers are evaluating ways to take advantage of efficiencies and cost reductions gained by disintermediating traditional financial institutions from the payment ecosystem. But what are the benefits and potential drawbacks of direct payments from buyers to suppliers via such emerging technologies? Register now for this BTN Group “In the Know” webinar, sponsored and developed by UATP, to learn about the heightened interest in disintermediation that is driving the rapid deployment of technologies such as blockchain. The panel will begin with an explanation of how these technologies have the potential to revolutionize travel procurement with a focus on payments. Along with New Distribution Capability, the airline industry is working to modernize air shopping with an initiative called One Order. A new era of airline retailing that combines a travelers’ personal data, payments and purchases on a single order is designed to replace the rigid booking, ticketing, delivery and accounting methods that travelers, travel managers and travel management companies find today. Instead of decoding, mixing and matching Passenger Name Records, Eticket and Electronic Miscellaneous Document designators, trip data will be combined into a single order record designed to enhance the traveler experience, reporting, duty of care, back office processes and more. How and when will this begin? 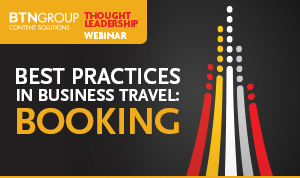 Register now for this BTN Group thought leadership webinar, sponsored by American Airlines, to learn the basics of One Order and questions you should be asking travel suppliers now to prepare. Flight disruptions can wreak havoc on travelers, travel managers and their travel management companies. Delays and cancellations cost the airline industry billions of dollars each year and cost passengers, corporations, and TMCs even more due to missed sales, meetings, and other appointments, not to mention the rework and rescheduling. What can you do to minimize such inconveniences to travelers and your business? Register now for this 45-minute BTN Group “In the Know” webinar, developed and sponsored by Lumo. Hear real-world stories about how flight delays, disruptions and cancellations affect managed travel programs, and most importantly, how savvy corporations are cutting their losses, educating travelers and minimizing the impact of irregular operations. How will economic factors and supplier strategies affect business travel buyers for the rest of 2018 and into 2019? What pricing developments can travel program stakeholders anticipate for air fares and hotel rates? Prepare for 2019 by attending our Travel Industry Forecast webinar, developed and presented by BCD Travel. Hear the global and regional forecasts, along with recommendations for how best to optimize supplier negotiations for next year during this 60-minute webcast. And ask your own questions during the live Q&A. Where are travel management companies investing in their businesses? How do they differentiate their products and services? When do they build, buy or partner to deliver client solutions? 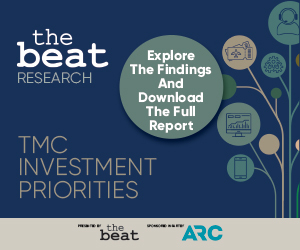 In a recent research report, The Beat surveyed 30 travel management companies—from the largest of megas to smaller, domestic players, and everything in between—to answer these questions and untangle how TMCs today are investing in IT, personnel, technology and operations. In this 60-minute webinar, sponsored by ARC, hear research findings along with trends in travel management technology from TMC experts. Ask your own questions of the panel during this live presentation and download a copy of The Beat Research Report. As the annual transient hotel requests for proposals season kicks off, what do travel buyers really want from hotels? Do they value the traditional hotel RFP process? Is the pain of the RFP process worth the gain? Register now to learn how leading travel managers are employing new strategies in their hotel sourcing game plans. 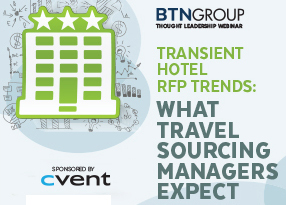 During this 60-minute BTN Group thought-leadership webinar, sponsored by Cvent Hospitality Cloud, also hear how travel managers polled this summer view annual RFPs, dynamic pricing, multi-year deals and more. What do travelers really want from their corporate travel departments, suppliers, travel management companies (TMCs) and technology? Travel managers from some of the most demanding travel programs--think high-tech, younger travelers, ultimate road warriors--highlight how they’re transforming their programs and meeting or exceeding traveler expectations during this free 60-minute webinar, sponsored by Air Canada. How happy are travelers? Hear a preview of the latest findings from BTN's Traveler Happiness Index. Ask your own questions of the panel during the live presentation. IATA’s New Distribution Capability (NDC) is the poster-child for change in travel management. But how might it impact your managed travel program or the roles of key players in your program? Hear from the IATA program lead for NDC and travel buyers at the heart of the project in this free BTN Group “In the Know” webinar developed by IATA. Learn what NDC is and isn’t. Gain a better understanding of the opportunities and challenges as the industry moves to a new distribution landscape. That drip, drip, drip you hear as company travelers book air, hotel and other reservations outside your managed program may well be growing louder. Lured by loyalty points, discounted pricing or simply the ease of mobile bookings on familiar apps, travelers are increasingly incentivized to book outside of preferred channels, your negotiated deals and most importantly, duty of care programs. While most corporations report air bookings through managed channels north of 80 percent, hotel program leakage of 50 percent or more is way too common, even in the best managed programs! With such holes, how can you track travelers, spending and leverage data in negotiations? Register now for this free, 60-minute BTN Group thought-leadership webinar, sponsored by Traxo, to hear the challenges, tactics, tricks and tools some companies are using to plug such holes in their programs. How are small and midsize travel departments—with limited resources and time—using real-time data instead of standard, historical reporting to change traveler behaviors in their organizations? Hear how companies can secure robust data sets, build and execute cost savings initiatives and transform the data into actionable intelligence to drive business decisions for key stakeholders. 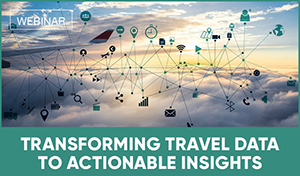 Register now for this free, 60-minute BTN Group thought-leadership webinar, sponsored by Travel Incorporated, to learn how leading business travel executives are using actionable data to enhance their managed travel program. It's time to choose your own adventure with our Meetings Management Experts. Acquis Consulting's Shimon Avish, World Bank's Sabrina Capannola and ZS Associates Kimberly Meyer will engage on the meetings topics that matter to you most: the GDPR journey, commission reductions, refining the SMM value proposition, SMM savings estimates, measuring return on investment, attendee engagement strategies … these are just a sample of what you can bring to table. Register now to attend, engage and learn! Artificial intelligence, machine learning, natural language recognition. Where does artificial intelligence fit into the managed travel practice? Business Travel News will bring together a panel of industry experts who are not only observing but also leading the market in emerging AI capabilities to talk about the current state of artificial intelligence for managed travel booking, service and reporting functions. We'll also talk about how AI stands to influence the buyer-supplier relationship and what the AI adoption trajectory may look like. 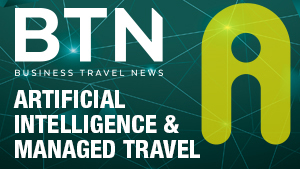 Attend BTN's Artificial Intelligence & Managed Travel webinar to find out how companies like yours may incorporate new AI capabilities to inform and enhance travel management strategies. With the number of small meetings on the rise, so too are challenges for companies to best manage them. Companies can no longer afford to ignore small meetings as the overall spend, sourcing challenges and risks have escalated. But how should they approach small meetings management? Learn the approaches and rationale of various companies in this FREE, 60-minute BTN Group thought-leadership webinar sponsored by Cvent. Hear what prompted the decisions to finally tackle small meetings within their organizations, how companies have approached it and the results. Many travel managers struggle with low hotel attachment rates. Given all the work and effort that goes into negotiating a preferred hotel program, travelers booking around the program can be a source of major frustration. Using new technologies that can capture, parse, and push data for analysis, reining in direct bookings is more of a reality than ever before. Hear real-world examples of hotel attachment solutions from ITW travel manager Cathy Sharpe, as well as detail on the data capture, cleaning, monitoring and reporting from Traxo and TRIPBAM during this BTN Group In the Know webinar, created with sponsor TRIPBAM. The pros and cons of direct bookings, as well as how to leverage new technology to increase control and visibility of your hotel program are also on the agenda. The corporate travel industry is rapidly evolving with the expansion of on-demand ground transportation options, driven by innovations in technology, and new waves of Millennial travelers who have a differentiated set of expectations. Your travelers are most likely using ridesharing, but are your policies and partnerships allowing your travelers to benefit from streamlined expense, data and other integrations? In this free, BTN Group "In The Know" webinar, created in partnership with sponsor Lyft Business, learn how integrating rideshare data with travel management company reporting is enabling employers to gain new insights into traveler trends and a more holistic picture of their travelers end-to-end trip experiences. Partnerships like those of Lyft, Deem and Flight Centre are allowing businesses to make strategic transportation decisions that provide optimized experiences for their people. Is Traveler Engagement Really Worth the Effort? Travel Payment Disintermediation: Opportunity, Threat, or Just Hype?